The primary source of this ancient and distinguished surname is the Old Welsh male given name "Hywel" meaning "Eminent, Prominent". This name was borne by Huwal West Wala Cyning (King of the West Welsh), recorded in the Anglo-Saxon Chronicles of Devonshire, dated 926, and by Hywel Dda, Hywel the Goat, Prince of all Wales and collector of the Welsh laws circa 950. 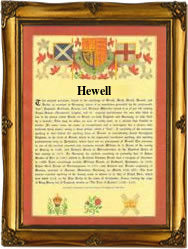 In 1184, In the modern idiom the surname can be found as Howell, Hewell and Howel. Hoelus de Charlion was noted in the pipe Rolls of Glamorgan, and a Howell filius (son of) Ade Walensis appears in the 1221 Shropshire Assizes. Early examples of the surname include: William Hoel (Wiltshire, 1183); John Hewell (Cambridgeshire, 1313); and Hyllar Howell (Somerset, 1327). The second possible source of the surname is English, and locational from a parish in South Lincolnshire called Howell. Recorded as "Huuelle" in the Domesday Book of 1086, and as "Huwell(e)" in the 1190 Pipe Rolls of that county, the place was so called from the Olde English pre 7th Century personal byname "Huna", from "hun", bear cub, with "well(a)", spring, stream. Early examples of the surname from this source include: Walter de Huwella and Alfredus de Howella (Lincolnshire, 1165 and 1177 respectively). Other examples are Walter de Huwella of Lincoln in 1165, Willaim Hoel of Norfolk in 1221, and John Howle of Cambridge in 1327. Thomas Howell, was chaplain to Charles 1, in 1640. The first recorded spelling of the family name is shown to be that of Geffrei Hoel, which was dated circa 1100, in the "Old English Byname Register", Devonshire, during the reign of King Henry 1, known as "The Lion of Justice", 1100 - 1135. Surnames became necessary when governments introduced personal taxation. In England this was known as Poll Tax. Throughout the centuries, surnames in every country have continued to "develop" often leading to astonishing variants of the original spelling.